Excellent questions—rein cues are seldom fully understood. First of all, there aren’t differences when it comes to English versus Western rein cues. The rein aids work the same and your horse will respond the same way no matter what style of saddle you ride in. Some might argue that the neck rein is strictly Western. However, I like my English horses to know the neck rein, too. It’s imperative for sports like polo (which is considered an English discipline because it’s done in an English saddle) where the competitor can only have one hand on the reins in order to play the game. Neck reining is also helpful when trail riding—if you need to have a hand free to open a gate or move a branch. Let’s clarify some other rein-aid terms. Neck, direct, leading/opening and indirect rein aids are all used when riding English or Western. The term “rein aid” simply refers to how you move your hand and the direction of pull you create on your horse’s mouth (up, back, sideways). The term “rein of opposition” refers to your horse’s forward motion when you’re pulling back on the rein. 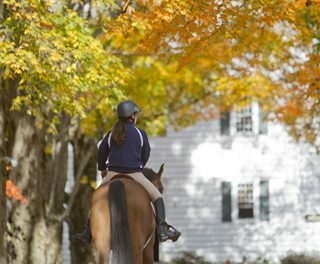 You’re pulling in a direction that is opposite to your horse’s forward movement. A “rein of opposition” tends to slow down your horse. For a direct rein, your hand moves from its neutral position (in front of the pommel, creating a straight line from your elbow to the corner of your horse’s mouth) directly toward your hip. There’s a backward (and slightly upward) pull on the rein and therefore it’s a rein of opposition. The basic neck rein is a gentle touch of the rein against the side of your horse’s neck, well in front of the withers and without opposition. 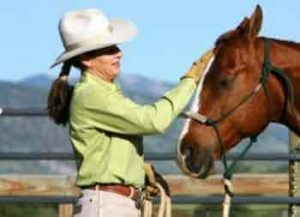 In neck reining, your horse is trained to move away from the touch of the rein on his neck and he moves his nose and neck away from the neck rein. If you pull too hard or cross your hand too far past the middle of your horse’s neck, you’ll inhibit your horse’s movement and he’ll actually turn his head the wrong way. 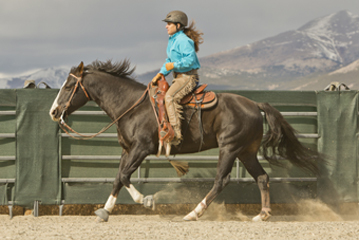 The neck rein is typically used for one-handed riding, but may be used two-handed in combination with another rein aid. For example, when you’re teaching a young horse to neck rein, you may use the neck rein as the outside rein aid and the leading rein on the inside to help control your horse’s nose. Eventually, your horse associates the neck rein with turning his neck and nose away from the rein and you no longer need the leading rein. The neck rein with opposition (a slight backward pull with the application of the neck rein) is called the “bearing rein” and may be used to turn your horse back on his haunches, such as in a roll back or a pivot on the haunches. There are two indirect rein aids: the “indirect rein in front of the withers” (not a rein of opposition) and the “indirect rein behind the withers” (a rein of opposition). The indirect rein in front of the withers is a lift up and in on the rein toward your horse’s neck, an upward diagonal pull on the rein; from the normal hand position, just lift your pinkie finger up toward your horse’s withers without pulling back, like you’re turning a key in a door. The indirect rein in front of the withers moves your horse’s shoulder in the opposite direction, while the nose stays bent in the direction of the turn. The indirect rein behind the withers has some opposition or backward pull, and causes your horse to move his hip away from the rein hand while your horse stays bent toward the rein hand, such as in a turn on the forehand or disengagement of the hindquarters. The direction of pull on the rein is up and back toward the rider’s opposite shoulder, in a motion like crossing your heart (the inside rein comes across your horse’s neck behind the withers). Some important caveats for all rein aids: it’s not the amount of pull or contact that causes a reaction in your horse, but the direction of the pressure on your horse’s mouth and the movement of the rider’s hand (when using the indirect rein aids especially—it’s only effective when there’s little or no pressure on your horse’s mouth). Also, when riding two-handed your hands should never cross your horse’s withers. If they do, the rein aid you’re using is ineffective and may be interfering with your horse’s motion (pulling his nose in the wrong direction). The rein aids are always supported by leg aids—we’ll cover that soon. This is a lot of information! It takes a lot of time and experience before a rider is able to use the rein aids articulately and effectively. For further information, refer to Volume 5 in my Principles of Riding DVD series, Refinement and Collection. This DVD explains and demonstrates the rein aids in detail. It never ceases to amaze me how responsive a horse can be to the lightest amount of pressure and the slightest movement of your hand. One really important thing I have learned through the years about rein aids is that the slower you move your hands, the better your horse will respond. NextIt’s crazy, the way we horse owners behave with our horses. How Do I Handle Riding A Spooky Horse?